simon alerted me that it is snowing outside just now. and sure it is… strange, the sky is so bright , even though it is a cloudy day, but the sun is shining through it, and is very bright… and the weather website says 5.5C, so it is not raining, and it is not cold, so why do i see small bits of snowflakes falling? amazing isn’t it? it is not a heavy snow fall. the forecast have been warning of cold weather. i dont believe them, and still dont even though i see snow falling here. haha. ok , you will say it is just me, refusing to believe what i see, even when it is right there in front of me… ah well, it does not matter, because i dont feel cold, so there. so what if it is -15C who cares,right? i only get bothered if it affects me, and i am not affected. so we should put it in perspective, so what if the forecast is -15C and it does hit -15C at one stage, somewhere. it will not affect us if we dont live there, or are indoors and out of it. haha. or if it is snowing and hails, if u are not affected, it does not matter. i read this article today by someone who is sad at the things that she sees happening in her neighbourhood. she sees homeless people and is sad, then one of the homeless people there make a rude remark about her, and she is sad. then she sees a hipster sipping coffee outside one of the gentrified coffee places and she is sad… hmm, it seems it is how one looks at things that needs adjusting… you cant sympathise with all the homeless, and then get sad when one of them shouts rude words at you… one goes with the other. you have to ask yourself what is it you want. there are consequences to your choice. it reminds me of all the celebrities campaigning for taking in all the refugees, whilst not considering how others will have to pay for it… they themselves dont pay for it, even those who say they will take into their homes some refugees, they never do. but everyone else pays, in over crowded schools, waiting lists for everything because of the heavy demand on these services by the influx of new people. and being sad because of all this is counter productive. does your being sad help them? or does it make u feel guilty for being happy when u see all these things happening around you? dont be, if being sad does not help them, why be sad? or perhaps u feel it is exercising empathy if u feel sad for them… it makes u feel you are a caring person. well, i guess if it makes u feel that, i suppose there is a purpose in being sad. if it makes u feel good…so i guess being sad is a small price to pay for that feeling. added. 5.28pm i had a peek at the weather website to see what the lowest temp today. it was 1.9C at about 7am this morning. i woke at 9am, so did not experience it when it happened. i was early to the library, which does not open until 11am, so i went into the waitrose nearby, which allows shoppers to go in 10mins or so before it opens to browse around. i saw reduced price veg, beansprouts 35p, brocolli 39p, and even lots of reduced pack of 8pork sausages 454mg 59p. (usually £1.20) and i got a free coffee as well. so that was a nice shopping trip. seems like it might be good to go early. but these reductions are hit or miss really, depanding on what they got expiring today. added. the sausages are actually very good. there was no oil coming out of them when i cook them, so they did not have that oily look about them, and they were delicious. life is quite pleasant for these unexpected reductions. otherwise the general world and local news is rather depressing. it doesnot affect me personally, but the doom and gloom rather can get to you, if u let it. that is why i skip the news a lot when i am reading the papers. i guess by their very nature, news will be gloomy and bad… otherwise it wont be reported. good news are not really worth printing out. sometimes if they were to adopt a policy of only writing about good news, i have a feeling it will still be depressing… because it will make those who read it look at their lives and compare with all the good news around and feel they are failures. whereas all this bad news can make some people feel happier, in that they are not affected and so be happy that they are not experienceing all that bad times that other people are going through. i think most people feel happy or sad in relation to others around them. and the skill lies in keeping a sense of perspective, and not allow sad people or sad events to influence you too much. added.when i got back i started cooking the sausages, the other 3 packs i frozed. (yes, i went back to the waitrose after the library and bought another 2 packs. ) and simon came back, so he was able to eat that with the stir fried ho fun noodles and beansprouts (char kuey teoh, we chinese call it) that i cooked. and we were both seeing a tv program while we ate, and it was a very funny one. an episode of ‘would i lie to you’. one of them says he can split an apple in half with just his hands. the others have to guess if he is telling the truth or not. they said he is telling a lie. but he was in fact telling the truth… and demonstrated it. simon says his mum would do it and split the apple with her bare hands … so that we two say it was true. but if simon had not told me his mum does it, i too would say it is a lie. i have never seen anyone do it in my life till now. amazing isn’t it that it can be done. the whole program was very funny and we laughed out loud. it feels so good to have a good laugh, makes life more happy. Truth Of The Matter Is…. The truth of the matter is, we need money to grow money. The more seeding fund one has as capital, the faster the business will grow. Of course, we must factor in brainiacs and not stupid oafs in the running of a business! Also, there is always Lady Luck. I do not know why they always address Luck as a Lady and not a Gentleman! I had a old jacket which i love but about a year ago, the zipper up the front did not work. it is a strange mis- function. one that i never seen before. usually the zip teeth breaks off and that is the death knell for a zipper. but this one, the zip head rode up the track and refused to come down. 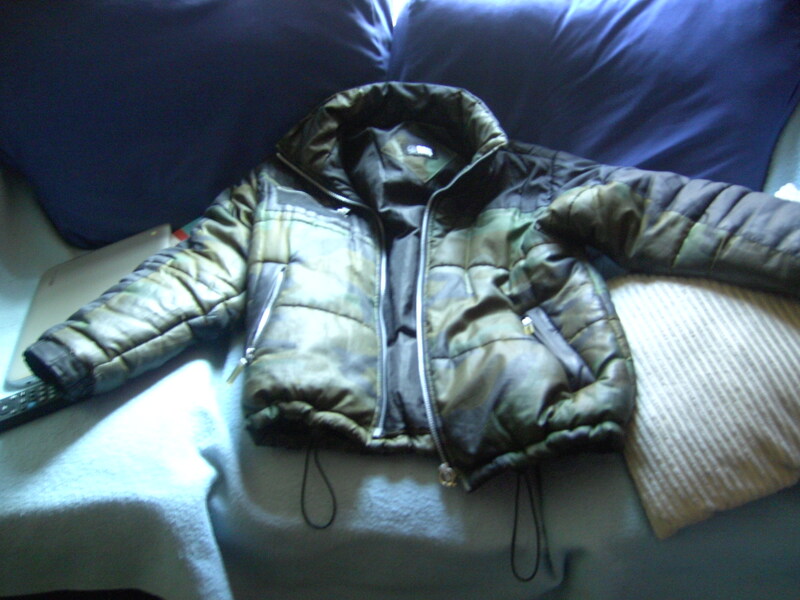 well i was rather sorry to lose the use of it, because it is a very good jacket, as you can see it is a quilt of heat insulating substance and very warm. i was reluctant to throw it away so kept it in my cloak cupboard all this time. well, i took it out recently because it is getting cold, and had a look at the zipper, and tried to figure how it worked and saw a little bit of metal comes down and prevent the zip from going back. so i took a needle and slipped it underneath the metal and kept it up and the zipper came down the track to the starting point. and it can be used again to zip up the jacket. but then i found out that i have to slip that needle underneath that small bit of metal in the zip head every time to bring it down and to unzip the jacket. it is not very convenient to use. i could not think of anything else to use, except maybe a paper clip but i dont have one in the flat. it is nowadays quite rare to find as most of us dont bother to use paper clips anymore. i use a staple to clip paper together if ever i need to do so. and slipped that in and lo and behold, it worked. and the ring looked quite stylish too and also the ring provide a purchase for my finger to pull the zip up and down. u can compare the zip for the front of the jacket with what the original zip looked like. 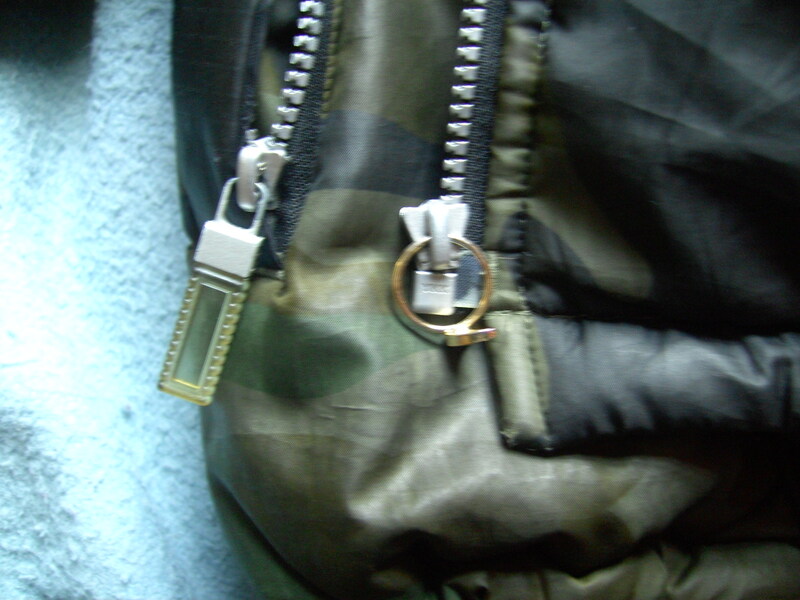 the one shown is the zip for the side pocket of the jacket. that handle had broken off and that was quite crucial for the working of the zip, as it keeps the little metal in the zip head from coming down and prevent the zip from going back on the tracks. I am very pleased that i could use the jacket again. but i wonder what would have happened if i had thrown away the jacket when the problem first surfaced. i would have lost the use of a good jacket. so maybe it is not so good to throw away things even if it does not work, as it can be repaired. this jacket has been used for a long time, and still going strong, in that the seams are still unfrayed. usually with wear and tear the seams are the first to go and the thread unwinds. another happy day today. i was at the library and after reading the newspapers and getting online, i noticed a gadgets of simon’s dangling on the strap of my gymbag. i wonder how it got there. i have been carrying it precariously entangled on my strap all the way from my flat on the bus to here in this library and not even noticing it until now and only because it was hanging right in front of my face as if from nowhere. it certainly was not there when i was lifting my laptop out of the bag, yet here i see it right by the opening of the gymbag. well, all i can say is i m glad my soul dont want me to lose it. do u know what it is for? i have no idea. must ask simon. anyway i must tell him i have put it on the shelf instead of on the chair. i wonder what it is used for. added. 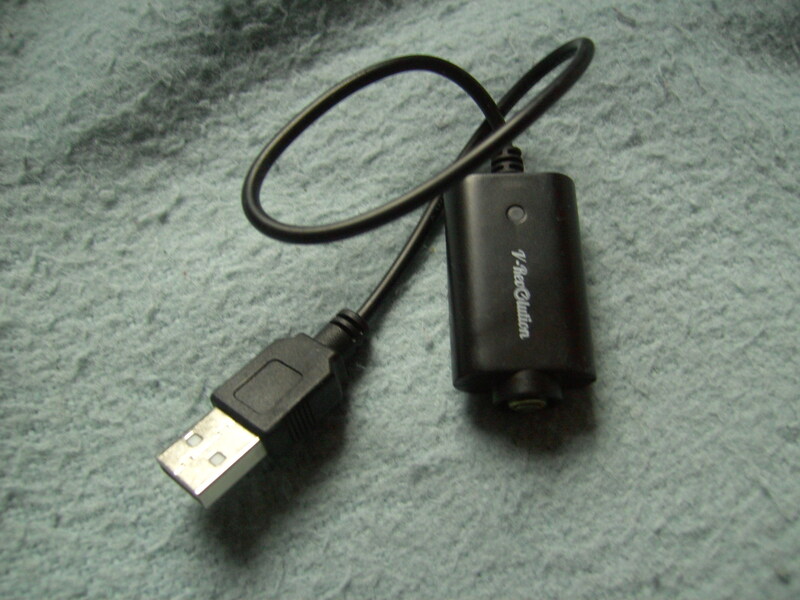 he said it is his charger for the electronic cigarette. it is simon’s stuff. he leaves it lying on the chair where i normally dump my bag whenever i get home. it must have got entangled in the strap of my gymbag. it could easily have dropped off anytime between my flat and the library and i would not be the wiser, and simon would be wondering where it went to, and asking me if i have seen it, and of course i would say no, even though without my knowing i would be the one to lose it. but thank my soul it did not happen. i have noticed this happening with others too. i can only say their soul and ours do not want them to go through it. there was this woman who came on the bus and , this is quite a common thing, start to fumble in her bag to find the oyster card… and dropping first one glove than the other and not realising it began to walk further into the bus. but a passenger alerted her to first the one glove than the other. and i was thinking well there is at least two souls who dont want that loss to happen. though i was thinking that woman’s soul may want her to lose those gloves one day… by letting her keep that oyster card in the depths of her bag instead of in one of the side pockets where it would be easy for her to find it…or even use the card without need to take it out, as the reader can access the oyster through the bag. this time she might not have lost those gloves but one day if she continues like that she will lose them. today i have added happiness, not only from not losing simon’s stuff, but also found a book to borrow in the library. 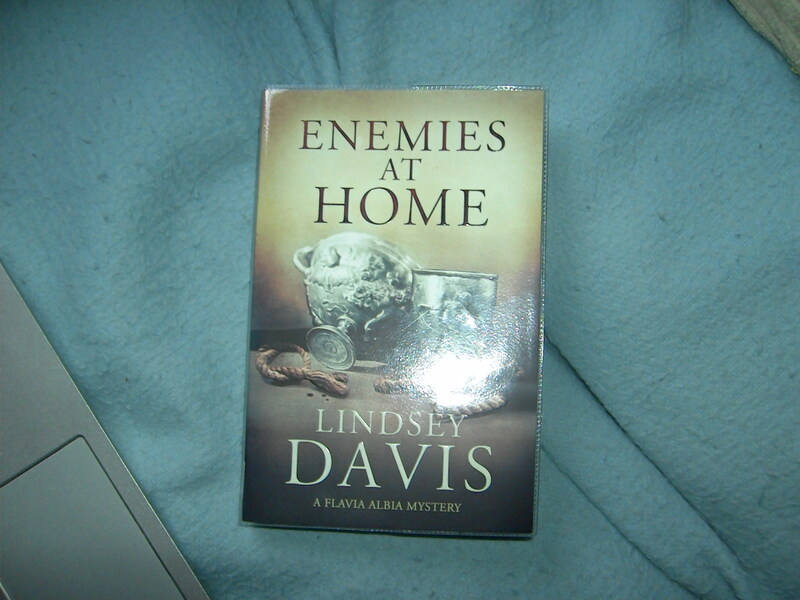 it is lindsey davis, enemies at home. i do enjoy her crime novels set in ancient rome. and then to top it all, i went to the waitrose branch near me and got a latte. and the walk back was very nice, through streaming sunlight filtered by the leaves and falling leaves. all the ingredients to make a happy feeling. oh yes, there is another thing. i had been having some pain in my left feet, so that it was painful to walk, which i realise was due to muscle spasm. so i took to stretching that muscle. i was stretching it whenever i could, at home, whilst waiting for the bus, and today it was fine. no more pain. and i could walk normally. well, being out of pain can really stretch your happiness i can tell you. haha. and no need for a survey to confirm it. I am sitting in the public gardens outside a caffe nero on the tottenham court road. i am using the cafe’s free cloud wifi. rather nice of them to let it be used by anyone not only their customers. though i expect i will get advertising from them seeing i have to register with my details. i had a nice free coffee from the waitrose nearby to accompany the moon cake i got free in chinatown. incidentally this branch of waitrose has really nice croissants. nice and puffy unlike the one that has newly opened in pimlico, opposite the tescos where the croissants look so small and collapsed that once when i went there to buy it i changed my mind when i saw them. but i would come all the way here for them if ever i get the urge to have one with my free coffee. I was too full today. Chinatown was celebrating the mooncake festival today and a stall there was asking the chinese people to sign up for activities. one of these activities i saw was a free health walk in canterbury later this month. and anyone who signs up gets a mooncake so that is how i got this mooncake i am eating now. getting free things is a great plus for happiness. sitting across me is the space where caffe nero customers were sitting. there were quite alot of them. none of them were using their laptops. i wonder why? one of them was on his phone. some were reading. i haven’t eaten one for some time and this one got 2 egg yolks. i am reminded how nice egg yolks are in moon cakes. it was very difficult to eat all of the cake. it is so ‘rich’. i am saving it for later. eaten over several days is the best way to eat it. there was a book came out talking about happiness and the review of it says the author suggests that one of the ways of being happy is to do new things. but from my experience with this moon cake, i wonder if happiness is rediscovering how nice something is that u used to do ages ago and have forgotten. it need not always have to be a new thing. i guess i shall read the book if i see it in the library. i wonder whether he mentioned the large role health plays in happiness. if u have bad health it can impact big time on your happiness. she said something that i think is very profound. she said ‘In reality, they are happy because for a brief moment, they are without desire.